INVENTORY CLEARANCE only $8.25 each, while supplies last! The Naujac Industrial cutter has a comfortable yet durable fiberglass handle. INVENTORY CLEARANCE only $3.75 each (min $14.00 per order), while supplies last! Blade stays hidden to prevent accidental cuts. INVENTORY CLEARANCE only $11.06 each (was $14.75), while supplies last! The Lande, Composite Deburring Knife with retractable blade! Includes one blade. INVENTORY CLEARANCE only $9.75 each (was $13.00), while supplies last! The Tabanac knife with solid blade. INVENTORY CLEARANCE only $299.25 each (was $399.00), while supplies last! F1076, Forsthoff Type 3000E hot air tool 120V 1900W. INVENTORY CLEARANCE only $364.00 each, while supplies last! Model: F0149: This hot air blower can be hand held or built into a machine for continuous operation. INVENTORY CLEARANCE only $7.13 each (was $9.50), while supplies last! INVENTORY CLEARANCE only $18.00 each (was $24.00), while supplies last! Chartron safety knife with SS blade for food industry. INVENTORY CLEARANCE only $9.63 each (was $19.25), while supplies last! Fine point black, white or yellow paint pens. INVENTORY CLEARANCE only $7.80 each (was $12.00), while supplies last! Long cut insulation knife 7.5", 3.63 blade. INVENTORY CLEARANCE only $24.00 each (was $40.00), while supplies last! INVENTORY CLEARANCE only $18.00 each (was $30.00), while supplies last! T7011 V-Grooving tool with four extra blades. INVENTORY CLEARANCE only $9.60 each (was $16.00), while supplies last! T5021 Weld Seam Slide for use with Quarter Moon Knife. INVENTORY CLEARANCE only $36.00 each (was $48.00), while supplies last! Small and Extra large size only, Reinforced Heatworx Gloves HW4. INVENTORY CLEARANCE while supplies last! PT555120 20w 1800lum was $95.00 now $80.75. INVENTORY CLEARANCE only $504.00 each (was $560.00), while supplies last! Model: F1040S, 230V 3000W Hot Air Tool. INVENTORY CLEARANCE only $1090.00 each (was $1454.00), while supplies last! 5840-00K, Durable and accurate kit for Air Flow measurements from Lufft. INVENTORY CLEARANCE only $351.00 each (was $390.00), while supplies last! 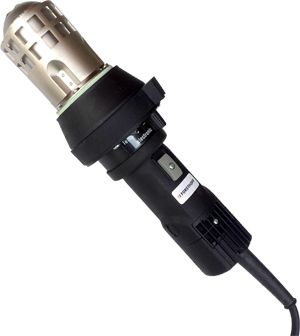 F1023, Our Versatile Forsthoff Mini Electronic Hot Air Tool 120V. INVENTORY CLEARANCE only $688.50 each (was $765.00), while supplies last! ARK125FX, Adjustable Bending fixture 125cm with protractor. INVENTORY CLEARANCE only $60.00 each (was $80.00), while supplies last! D17442050, Orange GCM extension cords with lighten ends, 50 feet.